Where were the stone tablets with the Ten Commandments kept? In the Ark of the Covenant. Jesus Christ foretold the global impact of His end-time work when He said that His servants would do even greater works than He. 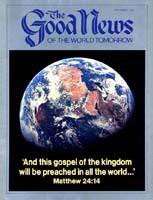 This article shows the worldwide scope of God's work today. Picture a long line of trucks filled to the capacity with the abundant produce of the wheat fields. As each truck pulls up to a giant grain elevator, workers rush to unload the freshly reaped wheat. By the day's end, countless tons of grain will be safely stored away.